The Recreational Vehicle Utilities Connection user fee is $30.00 Per Space-per day. Please call (903) 569-6183 to make a reservation. 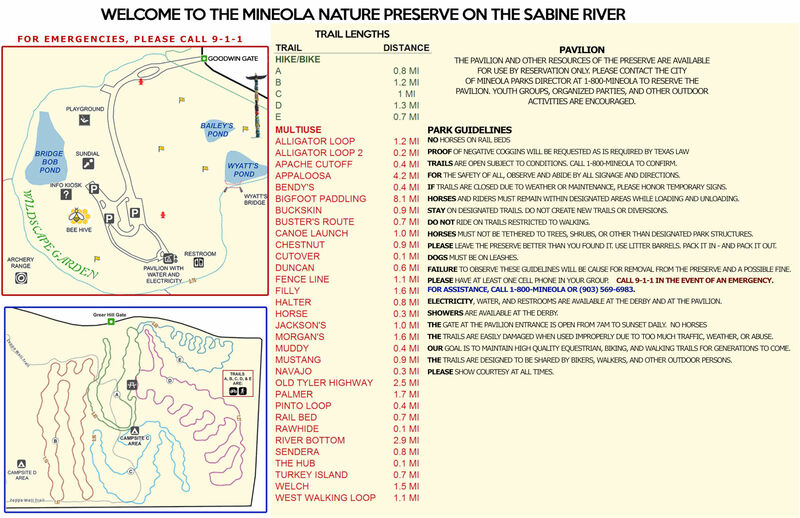 The primitive campsites require a reservation, a fee of $5 per night is charged. Click HERE for more information. For the Equestrian Trail Head: About one fourth mile, turn right on first road to the right (You will see the sign that says Wastewater Treatment Plant before County Road 2724). The signs at the top of the hill note horse trailer parking. The Pavilion, (THE DERBY), has restrooms and showers. Reservations for THE DERBY Pavilion are available by calling (903) 569-6183. Recreational Vehicle Utility Connections are available. For other than equestrians: After turning east on Loop 564, about one fourth mile and just past equestrian turn off, turn right (southeast) on County Road 2724. (CR 2724 or Cap Ranch Road). Follow signs about 1.5 miles to entrance. Reservations for the Pavilion are available by calling (903) 569-6183. 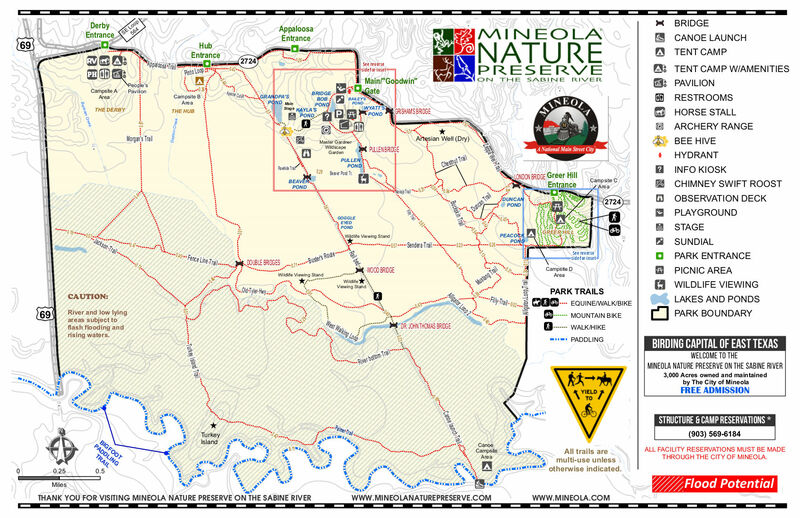 Via U.S. 69 from Greenville/Alba and also from U.S. Hwy 37: Continue through Mineola, proceed south until sign for Loop 564 is observed. Go underneath the overpass to Loop 564. Note directions above for the equestrian trail and other than the equestrian trail. Via U.S. Hwy 80, traveling west from Hawkins: Go under the overpass for Loop 564, immediately turn right (north) and follows signs to Loop 564. Continue right (south) on Loop 564 until reaching County Road (CR) 2724 and turn left on CR 2724. Follow signs about 1.5 miles to the entrance. (Equestrians continue on Loop 564 about 1/8 mile, turn left at the sign Wastewater Treatment Plant just west of CR 2724). Parking area for horse trailers is at the top of the hill. 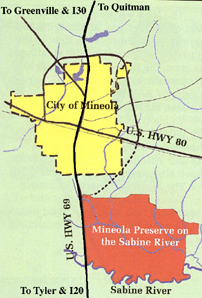 Via U.S. Hwy 80, traveling east from Grand Saline: Continue through Mineola to the intersection of U.S. Hwy 69. Turn right (south) on U.S. 69. Proceed south until sign for Loop 564 is observed. Go underneath the overpass to Loop 564. Note directions above for the equestrian trail and other than the equestrian trail.